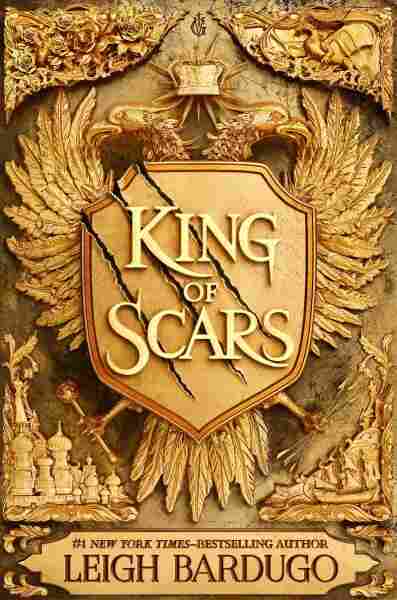 'King Of Scars' Muses On The Monstrous Leigh Bardugo's latest returns readers to her Grishaverse, a few years after a grand magical battle left young King Nikolai of Ravka with a demonic problem he's now struggling to keep secret. It begins with a simple farm boy, youngest of a crop of brothers, sent out into the storm to close a barn door that has blown open in the wind. Inside, there's a monster waiting for him. It ends ... later. In a very different place. With very different people. But the monster? It's still there. King of Scars, the latest from Leigh Bardugo and her Grishaverse, is a story all about monstrousness — about the regrets, the resentments, the terrible things that live inside everyone and what happens when those things come out to play. Specifically, it is about Nikolai Lantsov, king of Ravka, former soldier, former pirate and privateer (known occasionally as Sturmhond), former bright star of Bardugo's other books. He is young, witty, handsome, damaged — everything you want in a hero. Enslaved and tortured during his battles with the Darkling Prince (ex-Big Bad of Bardugo's 'verse, long-lived and, at the moment, very much dead), Nikolai was an actual monster once; the Darkling turned him into a kind of flying vampire bat-thing with a taste for human flesh. When the Darkling died, Nikolai turned back into a human and thought everything was fine. Only it wasn't. That monster still lived inside him — quiet for a while, but always there. And now it is getting stronger. That's where we begin. For a lot of you, all of that makes perfect sense. You understand Bardugo's intricately constructed world, its major events and recurring characters. You'll want to know what's going on with Kaz Brekker (present only in mentions by other characters) and Inej (ditto). How the world has fared in the years since the end of the Darkling, while Ravka rebuilt. But for the rest of you, I may as well be talking about King Batman from Magicland. Ancient curses, magic-wielding grisha and imaginary monsters? Means nothing to those who haven't followed the going-on in Ravka, Fjerda, Kerch and Shu. As with any long-running fantasy series, tumbling into the middle of something like Bardugo's interlinked stories can be tough. Understanding the emotional weight of actions and the long train of history that each character drags behind them is impossible. In the best case, you're intrigued enough to go back and try to catch up. In the worst, you just bounce off the mythology, shrug and move on. And I get that. I completely understand. Lot of books out there, only so much time. But wait just a minute and let me try to convince you of something. As a writer, Leigh Bardugo has three great strengths. First, she has created a world which she seems to understand down to each twig and stone, and moves through it with the confidence of a young god, proud of her creation and confident in its smooth, efficient operation. Second, this deep understanding of her world allows her to ... bounce. To tell stories over here, knowing precisely how they will affect things over there. King of Scars? It's the first in a Nikolai Lantsov duology. The last book was a standalone collection of fairy tales taken from her various kingdoms. Before that, a couple of books focusing on teenaged criminal mastermind Kaz and his friends (one of whom, Nina Zenik, is the focus of the second narrative in Scars, as she travels through Fjerda trying to save persecuted grisha and find a place to bury her husband, Matthias). Telling her stories this way allows for multiple entry points for new readers. Each small series is its own walled garden, with its own stakes, its own internal arc. King Of Scars is not the worst place to start. Third, none of the above really matters anyway because Bardugo's best trick is her ability to create characters that feel like friends and stories that you can slide into like a warm bath. There's a narcotic quality to her pacing — something drifty, strange and comforting, as sweet in the pauses as it is kinetic in the action. But the excuse for reading any new Grishaverse book is always the chance to hang out with whatever characters her scattered attention has chosen to light upon — all young, beautiful, witty, brilliant, tough, deadly and sly. Who are stronger than the terrors that lurk in dark corners, but never so Teflon that they walk away without scars. Without becoming, in some ways, monstrous themselves. ... she touches on religion, class, family, love — all organically, all effortlessly, all cloaked in the weight of a post-war reckoning with the cost (literal and figurative) of surviving the events that shape both people and nations. In King Of Scars, it is the chance to walk alongside Nikolai as he tries to find a cure for his demons before they consume him; to watch Zoya (Nikolai's general, bodyguard, friend) struggle to move past her hate; to listen to Nina, broken by the loss of her true love, speak to him in her head as she tries to find her way back from grief and cope with her new, terrible powers. With Nikolai, Bardugo gets to touch on politics, economics, spycraft and what it takes to rule both wisely and well. In Nina, she gets to tell a smaller (and arguably more powerful) story of loss, vengeance and oppression which comes to a seriously horrifying (but absolutely fitting) conclusion. In between, she touches on religion, class, family, love — all organically, all effortlessly, all cloaked in the weight of a post-war reckoning with the cost (literal and figurative) of surviving the events that shape both people and nations. Monsters are made. Every single one of them. They all come from somewhere. And with King Of Scars, Bardugo has given us an origin story for the ones that will plague her world in the future.